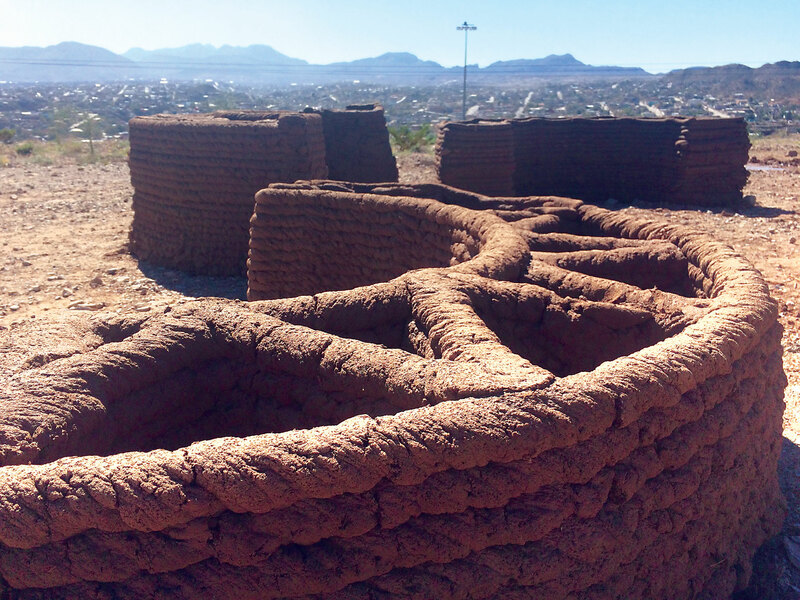 Ronald Rael and Virginia San Fratello, large-scale 3D-printed adobe, El Paso-Juárez border, 2019. Photo by artist. Ronald Rael is a professor of architecture with a joint appointment in the Department of Architecture in the College of Environmental Design, and the Department of Art Practice at the University of California, Berkeley. 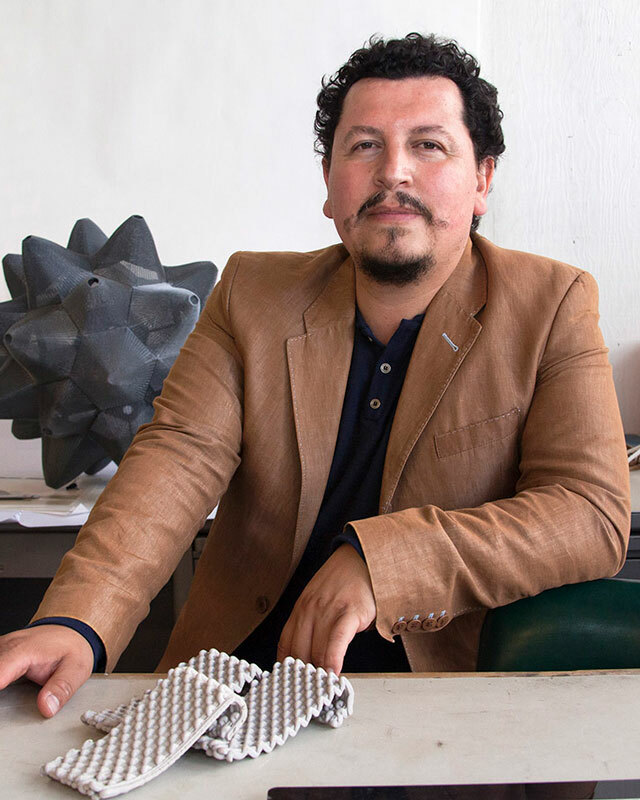 He co-founded the company Emerging Objects with architect Virginia San Fratello and is the author of Earth Architecture (2008), Borderwall as Architecture: A Manifesto for the US-Mexico Boundary (2017), and Printing Architecture: Innovative Recipes for 3-D Printing (2018). I spoke with Rael over the phone. Though he lives in California, at the time of the interview, he was in southern Colorado. It was October 2018, and he told me he was making a cup of hot chocolate. Bryan Czibesz: Your appointment at UC Berkeley is in architecture but also includes environmental design and art practice; your work is obviously reflective of that, and vice versa. You work in material studies and craft disciplines, too. Can you talk a little bit about your research interests, your background, and how all these things come together in what you do? Ronald Rael: Sure. Maybe I’ll contextualize it from my background, to start. I grew up on a small sheep and cattle ranch in Colorado, and this particular part of Colorado was the border between the U.S. and Mexico until 1848. The houses are adobe houses that have been in my family for a long time, and my family has lived in this region for eleven generations. And so it’s this landscape in particular that probably prompts all of my interests. I didn’t get into academia with a kind of intellectual interest. I was just curious about the way people make things traditionally, and how, in a borderland, there are interesting juxtapositions that don’t always merge. It’s a confluence of culture, of food, of language. Sometimes they move together, and sometimes they don’t. 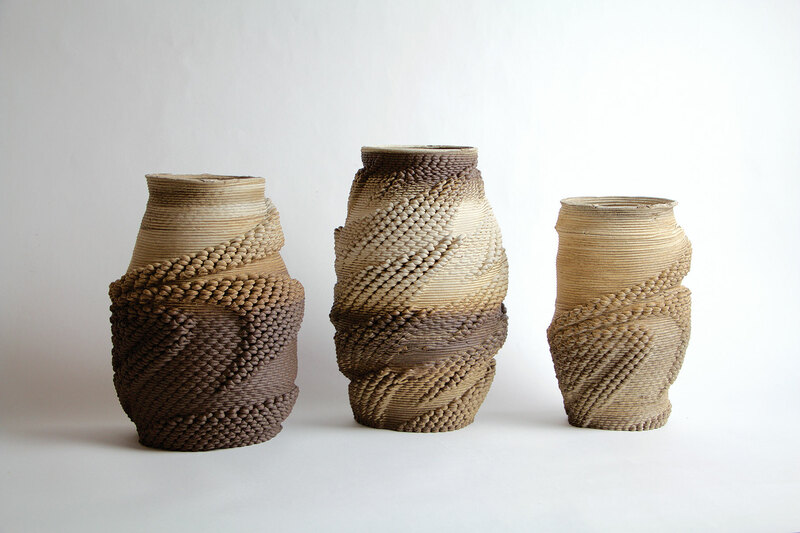 My interest in ceramics originates from my interest in earthen construction, as does my interest in 3-D printing. I started 3-D printing clay because I wanted to print mud buildings. It took me in the direction of working with lots of different materials and has now led to [designing] software and hardware, because I want more control. BC: Where did your interest in digital design and 3-D printing have its genesis? 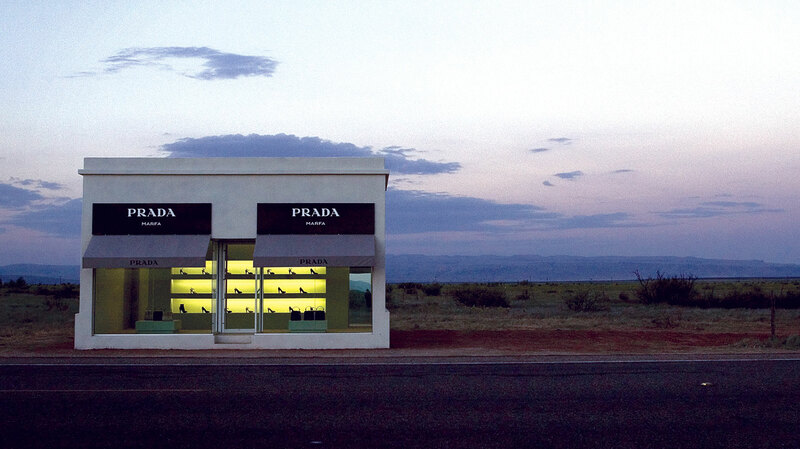 It was the moment that the digital revolution was born in architecture, and I was there. And simultaneous to studying modern architecture with Kenneth Frampton, who’s a renowned historian, I was studying at Avery Library, which is the best architecture library in the world; I was exploring my own architecture traditions in Colorado and New Mexico, as well as architecture made of earth all over the world; and I had a couple opportunities as a student to travel to West Africa and France to study earthen architecture. This led me to wonder, “Okay, well, is there a future to earthen architecture?” My continued interest and training in digital ways of making and representation just led, naturally, I think, to being able to address some of those questions. My work is grounded in borderlands, in a rural landscape. So it’s not so much born of an interest in form or an obsession with the technology, it’s more just [about developing] new ways of guiding and shaping the material, which I was familiar with from my childhood. BC: The Emerging Objects website describes the firm as a “make tank.” Can you talk about that term and your interest in object making, as opposed to architecture? RR: I was hanging out with this videographer today who asked me a similar question. I told him that I’m interested in the “architectural object.” Whether it is manifest in a building or a cup, I see [object making and architecture] as the same kind of study: it’s the same body of research; it’s the same interest. Most of the things we make are objects that are testing a material but that are also—have some trajectory towards a building in their form. Three years ago, we started working on GCODE.Clay [G-code is the common name for the numeric language in which people tell computerized machine tools how to make something]. We were squiggling around [doing 3-D printing in clay], something that everybody does now. We were just playing with the behavior of the machine, because we were wondering how to make a building using this process. All those tests were intentional thinking about buildings. It was just a different scale. Working on the translation and the scale shift between the two is an aspiration of mine: how do you jump scale? We’re also investigating how that particular material, printed, could be an architectural component and how can a component even be an object? For example, The Cabin of Curiosities is an object covered with objects. Any one of those objects is interesting as a piece of a larger whole, both in terms of the form and the material and what they do, their function. BC: There’s a lot of interesting relationships too, when you think about scale. There’s the relationship between a vessel’s inside and its outside, as spaces inhabited or contained, how you enter or exit from it. All those things relate to architecture, too. RR: I’m not a potter or trained in ceramics, so it’s been, actually, really gratifying for me to be around potters, because I realize that [ceramic vessel-making] is the same, it’s the making of space. You’re making a void. The object is the result of wanting to make space and thinking about these same issues of how something enters, how something exits. It’s often liquid or some other material, but I think it could be the body as well. BC: Your interests in scaling 3-D printing in physical size, as well as in production, have resulted in a few pottery projects that are part of Emerging Objects. What’s happening with those right now? RR: Sure. I’ll give a little background to it first. I was following Danny Defelici [owner of the company Deltabots, which makes the Potterbot clay 3-D printer] on Google+ for a while, about three years ago, and at that time I was trying to make a clay extruder, because I had these aspirations to print adobe. I wasn’t doing very well, and I thought, “This guy has the right way to do it.” I bought one of his first machines, and that’s where all this GCODE.Clay stuff came from initially. That launched us into a whole different kind of friendship that I didn’t expect at all, because there were plenty of times I went to people and said, “Hey, do you think we could do this?” And it was just not in their wheelhouse, or they thought I was crazy, or whatever. I had said to Danny, “What if a machine spun around itself?” I had not yet seen the Russian printer that did that, nor did I know about the SCARA [Selective Compliance Assembly Robot Arm], an older type of robot. Danny made a prototype that spun around, and it was kind of awkward, but it was actually similar to what the Italian organization WASP [World’s Advanced Saving Project, pioneers in the manufacture of 3-D printers] has built now. Danny discovered the SCARA and said, “All the mathematics are there. This would be easy to build.” And so [our machine] is kind of an adapted SCARA. Now we have a really big one in production that we’re going to put to the test in a couple weeks. We realized that it can print a number of objects at once or it can print a big object. It’s a robust printer, and I’m excited about what that means for architecture. But the pottery thing you’re asking about, The Bottery, was a test case for our thought that, “OK, well, if we have to produce lots of things, what does that mean?” So we made this software. We made this robot, and now we have, I don’t know, hundreds and hundreds of cup orders to fulfill. That’s a whole different level of production; we’re learning what that means. The first 200 cups that we just shipped out, was like, jeez, that was not easy. We learned about mass production, and we learned about what it means to have continuous delivery of material. We’ve gotten good at that, so I think that in the next version of The Bottery, we’ll be able to handle larger production runs a little bit more elegantly. BC: One of the things people champion about 3-D printing is that, unlike production from a rigid mold, which requires you to make identical things, 3-D printers don’t care about variation or shifts in scale because those changes can be made digitally. How does that play into these large production runs? RR: Well, I think that’s true, that the printer doesn’t care. What I realize is that people care—the people who are pressing the button, that have to pack these in boxes—feel the problems. If we’re producing different things, like, let’s say, for 500 different customers, we’re gonna make 500 different things, then it’s easy to press the print button 500 times, but when you’re managing [the physical production and logistics], then it gets a little bit crazy. We’ve done some experiments in our architectural projects that specifically looked at this issue of data management. We wanted to know how we could make something with the least number of parts. Rather than managing 2,500 unique parts, we’re only managing four parts, and we can code them in a way that’s also part of the aesthetic of the building. Those kinds of exercises are interesting for us. They force us to think about how we might make something in a way that facilitates something that’s unique, taking advantage of what a printer can do, but also that produces objects that are not repetitive and homogeneous but have their own character. For example, we put mass production to work on the ceramic cladding for The Cabin of Curiosities. Approximately 4,000 tiles that we printed for the cabin are all the same, but we designed it so that the printer makes unexpected errors. A flange on each tile causes every one to be unique because of the nature of the behavior of the printer. So, rather than printing 4,000 unique things that are parametric, it’s 4,000 unique things that are just based on the machine characteristics. BC: And the material, to a certain extent. RR: Right, because we decided to use recycled Cone 10 clay. Sometimes there’s some iron in there, for example, so the colors and the tones are slightly different. That’s a whole other aspect of what it means to mass-customize something. BC: So let’s get political for a little bit. Can you talk about the Bad Ombrés project? For a project that will be part of an exhibit in January, we’re collecting clays along the border between Juarez and El Paso. The complexion of clays that are emerging from that landscape are really amazing. We’re making a series of vessels that are—I don’t know if I’ll call them “Bad Ombres” or not. Probably not. Maybe I’ll call them “Good Ombres.” But we’re gonna print these objects so that they vary in color and in material characteristics, and we’re also going to start to blend the clays, as well, to express these political relationships. The exhibit is called New Cities, Future Ruins at the Border [curated by Gavin Kroeber]. Another aspect of this exhibition is that we’ve brought an adobe maker on board. We are taking the giant printer to the border between Juarez and El Paso, and we are going to use local clay to print. Now, there’s different ways that the printing might manifest, and I’m a little bit hesitant to reveal what our main goal is, but I’m gonna do it anyway. The main goal is that there’s an adobe house at the intersection of New Mexico, Texas, and Chihuahua, where the Mexican Revolution began. It’s called Casa de Adobe, and it’s a museum. It’s also the point where the border marker number one begins, which is the point on the Rio Grande that marks the border between the United States and Mexico. From there to California, it’s a land border defined by American and Mexican surveyors in 1855. This is an intense geographical, political, historical, and cultural landmark, so we wanted to place the printer right there. It’s also the only place where a border wall cannot be built, because of a tristate and international agreement to have access to the Rio Grande. The printer would create a new kind of “future ruin” monument that would span the border. I don’t know if we’re gonna be able to pull that off, but we’re going out there in two weeks to try. This will be the first big thing we’ve printed, so we may just go to the University of Texas, El Paso, and try to print something big—I’m talking above six feet big— to see if that works. If that’s successful, then we will go out to the border. I don’t want to have an international disaster on my hands, an international failure. BC: This makes me want to talk about the border and the book, Borderwall as Architecture. From what I could tell, it had an interesting genesis—an event that you experienced on the border? So, that’s how [the book] was born. Virginia and I just started producing a set of, I would say, musings about what that meant. And it wasn’t about us designing walls; it was more about coming to terms or reconciling what was occurring and, also, hyperbolizing what was occurring—in a way, it was a form of documentation. I remembered that when I was in junior high, I wanted to be a political cartoonist. The book might be considered to be illustrated with a series of political cartoons, rendered as an architect would render something, and I realized, recently, that leads to a sense of confusion. When an architect draws something, it suggests that the architect is proposing it. When I was drawing things, I wasn’t proposing them, I was reflecting on them. [It was] satire. I was making a point about how ridiculous I thought things were. So everything from the teeter-totters to the solar wall, I think they’re different versions of ways of thinking about the wall. This misunderstanding, that I’m proposing walls, is unfortunate. I think it’s a little bit lazy. I wonder if the critics even read the book, to make assumptions about me designing walls at a time when several architects actually want to design [Trump’s] wall. And they’re very serious about it, which is also unfortunate, because I don’t condone any construction of the wall or new walls or even different walls—we’re advocating for ways to engage the whole idea of the wall. Many artists engage with [the idea of the] wall, and some artists have even realized some of the drawings in [Borderwall as Architecture], however they do not receive the same criticisms, such as, “Oh, you’re putting pearls on a pig,” or “You can’t engage in this, because you’re perpetuating the violence of the wall.” You just have to ignore it. Many of my heroes in the art world are engaging it in a really productive way that shows that design and art can be valid forms of activism. For example, in the book, I talk about Ana Teresa Fernandez, who painted the wall to suggest its erasure. BC: So in terms of protest and activism as an architect, what is your response to somebody seriously asking you what the wall should look like? Say, the wall has to exist, what is the best form of protest in the context of the reality of the wall? RR: I have been approached by major 3-D printing companies who say, “Hey, let’s go in on this together to 3-D print the walls. You have the perfect credentials for that.” And my answer, of course, is no. It’s a teaching moment to say, “Look, here’s why I think it’s a bad idea.” I’m actually very surprised that I’ve never seen a proposal to 3-D print the wall. It seems like something that would go viral on the Internet. But thankfully, there’s never been somebody putting such a proposal forward. Let’s say I had the opportunity to have a discussion about that. I would say what I’ve often said. I consider the wall to be an infrastructure project; it’s a security infrastructure project. In the majority of the cases that I’ve encountered, especially in Mexico, people see the wall as a kind of infrastructure no different than a highway overpass. These kinds of infrastructure are often built in contexts that take advantage of the population; highway overpasses are always built in minority, impoverished communities, and wastewater treatment plants, the same. These projects perpetuate violence and poverty and health problems as well, and I don’t think the answer is to not engage the spaces that those projects endanger. I think those are precisely the landscapes that need parks, need investment in education, and clean water, and connection with the community. We could simply say, “Let’s knock down the wall,” but I think you can’t stop there. You have to begin to stitch together the communities because once the wall is gone, a scar remains. For example in San Francisco, a highway overpass was built through poor black neighborhoods and the result was violence and crime. It then fell as a result of an earthquake, and once that highway was gone, these communities started to be stitched together. There’s a green belt where the highway used to be. So one can think about these events as opportunities. I see opportunities for architects to think about in the future, like, what is to become of these landscapes? And so, turning a blind eye on problems, such as the border wall, is unfortunate. That’s not a form of activism; activism is engaging problems head on. BC: I think that’s a good segue into your work with WASP, an acronym that involves saving the planet. I can never remember exactly what it stands for. RR: Let me just say, because we had such a good time talking about it one night, it’s the World’s Advanced Saving Project. And “World’s” is a possessive. It’s not plural. But I’m not directly affiliated with them—I was recently invited to speak at one of their events. BC: It’s a trope now, that 3-D printing is the next big thing, it’s the new technology that is going to save everybody. Can you help us understand that, in terms of what this company really wants to do and what your role in it is? RR: I come to 3-D printing with a healthy degree of skepticism about its potential to save the planet. I would also say that one of my critiques of 3-D printing, and maybe what pushed me into thinking about alternative materials for 3-D printing, is that one of the biggest problems on the planet is the use of plastic. Here comes along this “world-saving” technology that perpetuates the use of plastic. To me, there’s a problem right there. To 3-D print automobiles, for example, and to print 3-D military barracks, defies utopian ideas about “saving.” I have my skepticism, and it’s been a productive skepticism for me. Probably every time I lecture, somebody raises their hand and says, “Can you print beautiful houses for the poor?” I think that’d be great, and I would love to be the person who does that, but it is still quite expensive—it’s not there yet. 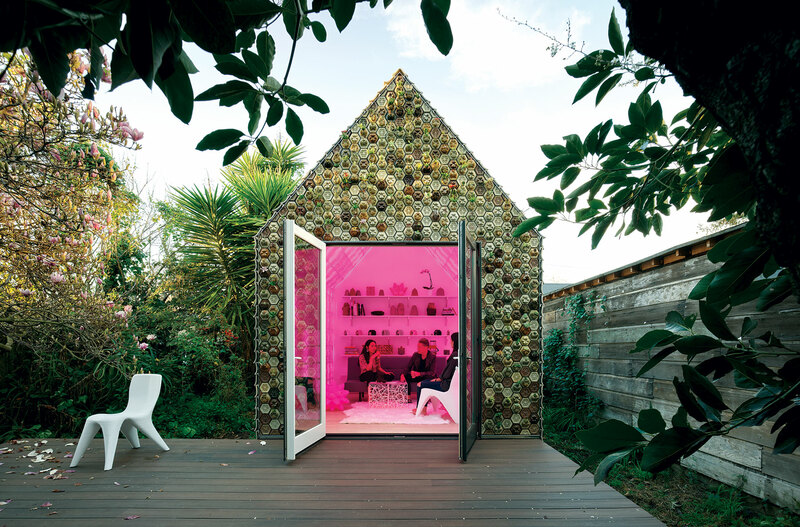 And my desires for 3-D printing with earth are not necessarily aligned with desires for low-cost housing. They’re more selfishly guided desires about material and form and architecture. I have a healthy amount of jealousy for WASP, who 3-D printed [a low-cost] house, because I would’ve liked to have done that. What’s beautiful now is that [WASP and I] are in conversation with each other, but we don’t have any plans to do anything in the future. I think they are doing good things, and I’m pretty sure that they were inspired by some work that we’ve done. I’m involved in a long term project with 3D Potter right now, however, that’s looking at both ends of the spectrum, 3-D printing and earthen architecture, so it is not dissimilar to what WASP has achieved. The innovation that my partner Virginia and I have achieved is within the realm of inexpensive architecture, and we do have desires about helping, particularly to help the ninety-nine percent. One of my architectural heroes is this Egyptian architect, Hassan Fathy. He was a famous architect at the time of Frank Lloyd Wright and Le Corbusier, but nobody knew of him because he was in the Middle East. He wrote a book, Architecture for the People, about creating earthen architecture for the people, that was beautiful, elegant, and inexpensive. Fathy and his book are important motivators for me in thinking about [how to serve the ninety-nine percent]. 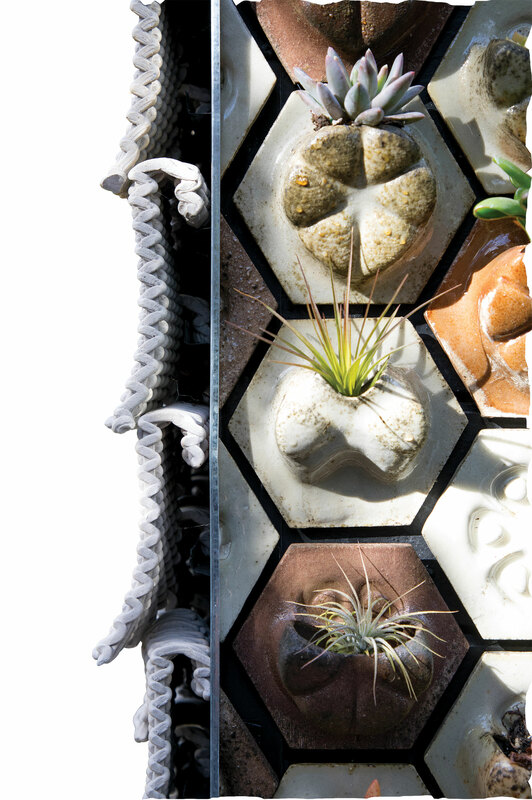 WASP has very utopic ideas about making in the twenty-first century, and they are invested in everything from architecture to health to art. They have followers, both employees and fans, who believe this technology has the potential to make huge changes on the planet. BC: Right, there’s not a single object that you can print that magically and immediately saves the world, so it’s probably good to balance the idealism of the goal with some practicality. RR: I met this young physician who developed 3-D printed implants for infants that have a very peculiar condition where their bronchial tube collapses. He created a 3-D printed insert they can place into the bronchial tube, and it ultimately dissolves in the baby and creates a scar that firms the tube and keeps it open, allowing the child to breathe. This is the most brilliant innovation I’ve seen. He was allowed permission to try this because the FDA approves emergency tests when the baby is going to die, and it worked. Now it’s been used several times. So I think there are ways that designers and artists and creative people can use technology for improving people’s lives and, to that end, save the world in some ways. I recognize that it will take some time. BC: The smaller projects—the coral larvae habitat and the auklet habitat—do you want to talk about those, maybe in the context of what you just said? 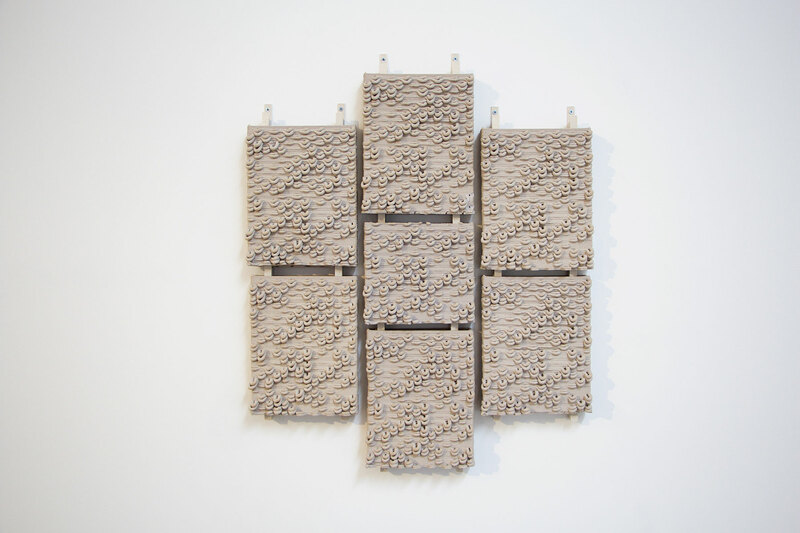 RR: There was one day when coral reef specialists came in and saw all the 3-D printed clay objects, and they said, “Wow, that would work as coral habitat,” because ceramic works very well for the particular parameters that coral larvae need to propagate and to feed on a substrate. Not long after that, we began to work with a group of scientists from around the world. There’s a whole consortium of scientists who asked us to design these seed pods based on parameters that they have developed over years of study into how coral can be seeded in the laboratory and in the ocean. We created five or six different types of seeding units and produced over 4,000 of them, which are now being tested all over the world. That’s pretty exciting for us, because it’s where our material research and robotic behavior research is applied in the realm of saving the planet. This is exactly what we wanted to do. I would align this project with our activism—how design can be activism. There are several ways to be an activist, and one could abandon one’s own professional tools, let’s say, and picket and protest, but I think that one can invest in their craft to be an activist. For example, we have also been collaborating on creating artificial bird’s nests—a collaboration between a scientific organization and a ceramic artist, Nathan Lynch. Nathan has been producing ceramic nests for the Cassin’s auklets, whose habitat has been increasingly endangered because of sea level rise. For him, producing these nests is slow; the forms are very complex, based on the scientists’ specifications. He approached us to about 3-D printing them, and what advantages that would have over hand-building. So, last year, we produced the first versions, which are now being tested, and we’ll find out how successful they are soon. Just this last week we wrapped up version two of these nests, and they’ll be taken out and tested this year. If they work, the new design can be 3-D printed as one object, [which has benefits for both the scientists and the manufacturing]. And so it’s exciting to think about how other projects like this might improve habitats. As we were developing the technology and working with the GCODE.Clay, we realized that the nest could be scaled as a human habitat. 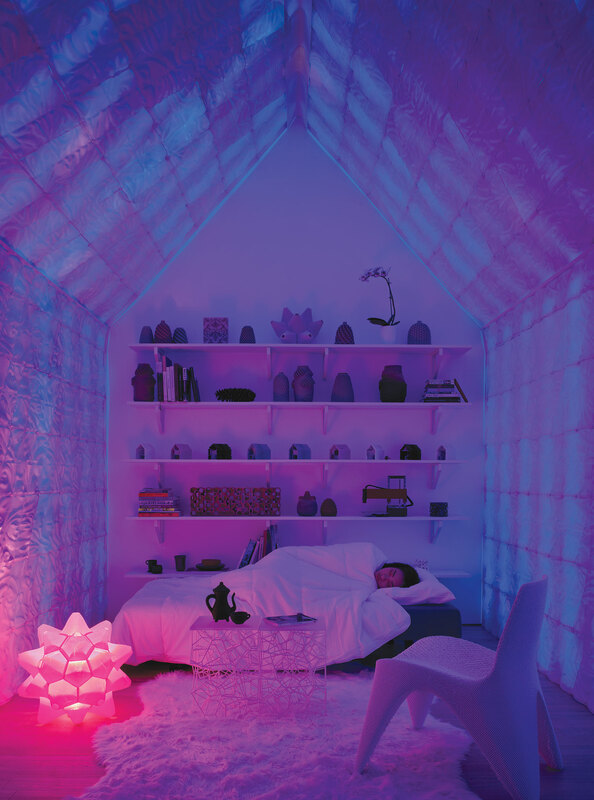 They have interior walls; they have exterior walls; we have thermal cooling and insulation. Because the birds need all that, we can translate that to a larger scale. We’re at the infancy of testing the hardware that can do that sort of thing using a local material. BC: Is there anything else that you have going on or are thinking about that you want to add to this conversation? RR: I started this conversation talking about adobe houses here in Colorado, all made out of clay. I’ve invited individual artists and an artist collaborative called M12, to come here. M12 runs a rural field school for art students from all over the world who can get credit through the University of Colorado. They use these houses in summer as a home base for the school. Fifteen students, some assistants, and a couple of professors stay here and produce art in the landscape. I’m hoping there can be a ceramic component—maybe we could use local earthenware that is tied to the regional history. Also, I just became full professor two days ago! RR: Thanks. It’s a moment to take big risks. If I can lasso earthen architecture, 3-D printing, education, and borderlands, I think that would be a nice way to move into the next phase of this career. BC: And maybe dispel the idea that there’s a border in the first place, which seems to be what the landscape and all of your background says. RR: And thinking of that place as a productive place, not a negative place. I think borders are often thought of as negative places. As someone who spent a lot of time in Juarez and Tijuana, I think those borderlands are exciting, interesting places because of the different cultures rubbing up against each other. We can acknowledge them and accept that these are not the fringes of a territory, these are actually the centers of a territory that is deep and thick and full of possibilities. BC: It’s an honor to be talking to you while you are in Colorado, which is a beautiful part of this conversation, so thank you so much for taking the time while you’re there to do this. I hope you drank the hot chocolate you were planning to. RR: Yeah, I did. I really appreciate you allowing me to be involved, and it was nice just talking to you.